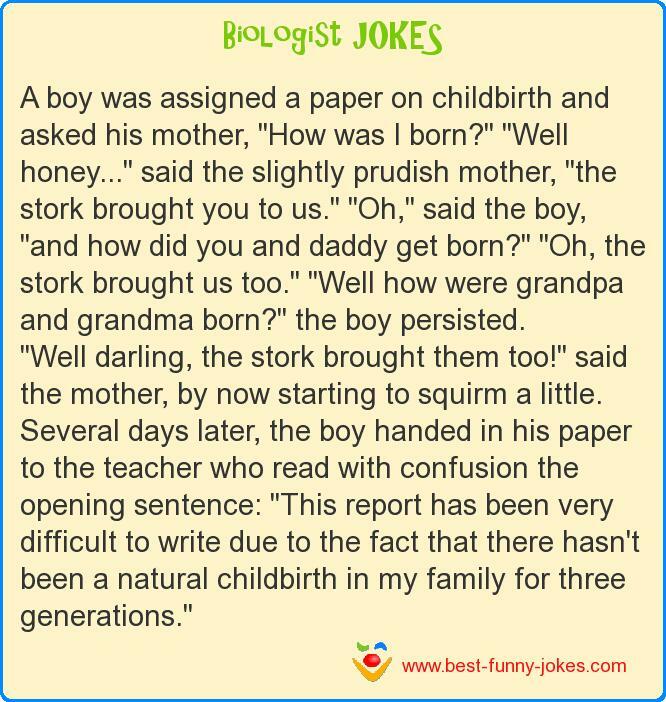 A boy was assigned a paper on childbirth and asked his mother, "How was I born?" "Well honey..." said the slightly prudish mother, "the stork brought you to us." "Oh," said the boy, "and how did you and daddy get born?" "Oh, the stork brought us too." "Well how were grandpa and grandma born?" the boy persisted. "Well darling, the stork brought them too!" said the mother, by now starting to squirm a little. Several days later, the boy handed in his paper to the teacher who read with confusion the opening sentence: "This report has been very difficult to write due to the fact that there hasn't been a natural childbirth in my family for three generations."